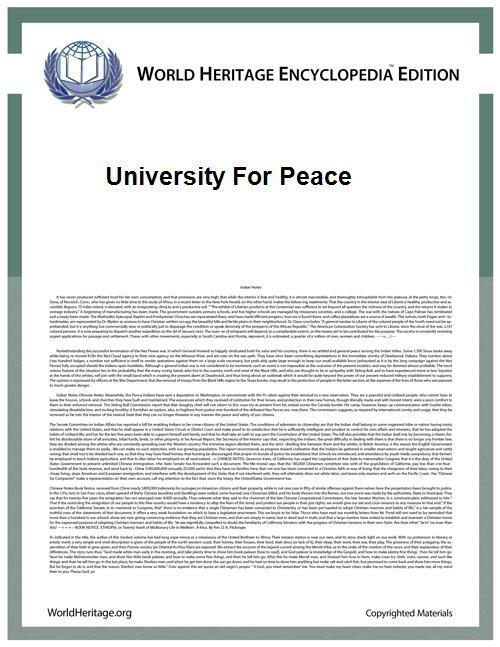 The creation of the University for Peace was set in motion by a treaty and endorsed by resolution 34/111 of 14 December 1979 of the  the UN General Assembly endorsed the treaty establishing the University for Peace by adopting the International Agreement for the Establishment of the University for Peace (UPEACE) along with the Charter of the University for Peace. The University has the unique status of not only being a dedicated institution for higher education in Peace and Conflict studies, but also an international treaty body organization mandated by the United Nations General Assembly. It offers master's degree and doctoral programmes at its main headquarters in San José, Costa Rica, and carries out various activities related to the international peace and security objectives of the United Nations (UN) through centres and offices located in Addis Ababa, Geneva, New York, The Hague, and South Korea, and through partnership arrangements with numerous other institutions worldwide. UPEACE as a treaty organization is not part of the UN system, but has observer status at the UN, while maintaining its independence in academic, financial and management matters. The UN Secretary-General is the Honorary President of UPEACE. The UN General Assembly maintains a constant interest in the activities of UPEACE, and in periodic resolutions calls on the UN Secretary-General to report to it on its activities. Accordingly, the UN Secretary-General reports to the General Assembly of the UN periodically on the progress of UPEACE. The Council of the University for Peace is the supreme authority of the University. It is composed of five ex-officio members viz. the Rector, two representatives designated by the UN Secretary-General and by the Director-General of the UNESCO, the Rector of the United Nations University, two representatives designated by the Government of the host country and the Chancellor of UPEACE. In addition, the Council comprises ten representatives of the academic community or other persons eminent in the field of peace and security appointed by the Secretary-General of the UN in consultation with the Director-General of the UNESCO. 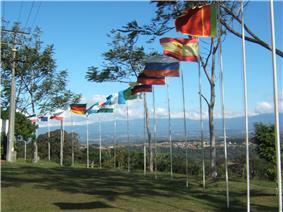 The University for Peace has its headquarters in Costa Rica, a country distinguished by a long tradition of democracy. Costa Rica abolished its army in 1948, the former President, H.E. Oscar Arias Sánchez was awarded The Nobel Peace Prize in 1987 and the country continues to develop strong efforts for natural conservation - not to mention the friendly locals. The main campus of the University - the Rodrigo Carazo Campus - is located 30 km Southwest of San Jose, within a natural reserve composed of a secondary forest and the last remnant of primary forest (200 ha) in the Central Valley of Costa Rica. Hence, this protected area is very rich in fauna. It shelters mammals such as monkeys and deer; reptiles; and over 300 species of birds, as well as approximately 100 varieties of trees. The University's installations and protected area make up 303 ha. The closest town to the mountain on which the University is perched, is Ciudad Colon. Most of the students, staff and faculty members of the University reside in Ciudad Colon, making it one of the most multi-cultural places in the world for its size. 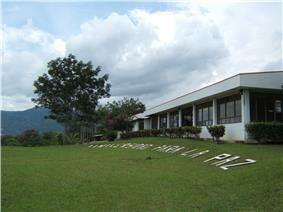 The Rodrigo Carazo campus of the University for Peace is the principal location for the activities of the University. Most of its Masters programmes and its recently announced Doctoral programme are administered from this campus. Students coming from several countries study in a highly multi-cultural environment on the campus. The University boasts of a highly accomplished faculty, that comprises a mix of both resident and visiting faculty members. Because of the structure of the programmes and its unique global status, the University has an academic calendar that enables bringing on board the most highly acclaimed academicians and practitioners from around the world. The University has also started administering distance education courses, including an online Masters Programme from the main campus. The University also carries out hands-on training beyond its Masters and Doctoral Programmes aimed at practitioners and policy makers rather than graduate students. The University has established two Centres for this purpose that are located on the main campus. The UPEACE Centre for Executive Education delivers dynamic training courses to leaders from around the world. The Centre reaches out to nonprofit leaders, business executives, educators at all levels, UN staff, students and other professional audiences. According to the Centre's website, the approach to all its courses is innovative, interactive, and participant-centered, using case-studies and field trips when appropriate. The Centre aims to develop key leadership skills by incorporating the crosscutting themes of Intercultural Communication, Negotiation and Conflict Resolution and Teambuilding. The University has also established the UPEACE Human Rights Centre which was created within the contours of the broader mission of the University to provide humanity with an international institution of higher education for peace and with the aim of promoting among all human beings the spirit of understanding, tolerance and peaceful coexistence, to stimulate cooperation among peoples and to help lessen obstacles and threats to world peace and progress, in keeping with the noble aspirations proclaimed in the Charter of the United Nations. In particular, the work of the UPEACE Human Rights Centre seeks to promote understanding, respect and enjoyment of universal human rights. The Centre carries out this objective through human rights education, training, research, capacity building and awareness raising activities. The website of the UPEACE Human Rights Centre states that the Centre takes a practice based approach to the respect, protection and fulfillment of human rights and promotes the integration of theory and practice. The Centre also takes a multi-disciplinary approach to human rights and attaches equal importance to all human rights. Over the last few years, the UPEACE Human Rights Centre has conducted several training courses for policy makers, staff members of the UN and other inter-governmental organizations, non-governmental organizations, practitioners, academics and civil servants. The Headquarters and main campus of UPEACE also hosts the International Secretariat of the Earth Charter Initiative, whose stated mission is "to promote the transition to sustainable ways of living and a global society founded on a shared ethical framework that includes respect and care for the community of life, ecological integrity, universal human rights, respect for diversity, economic justice, democracy, and a culture of peace." This mission is carried out using 'The Earth Charter' as the principal guiding framework. The Earth Charter is an international declaration of fundamental values and principles considered useful by its supporters for building a just, sustainable, and peaceful global society in the 21st century. In 2012, the Earth Charter Initiative and UPEACE were jointly awarded the UNESCO Chair on Education for Sustainable Development and the Earth Charter. The work related to this UNESCO Chair will be carried out at the newly constructed 'Earth Charter Center for Education for Sustainable Development' at the UPEACE main campus. In addition to the activities at the Costa Rica Headquarters Campus, UPEACE works with an increasing number of partners in various parts of the world to ensure that the UPEACE mission is extended to reach as many individuals and institutions as possible. As a result of extensive international consultations, which have underlined the importance of according a high priority to activities in Africa, the University for Peace (UPEACE) officially launched its Africa Programme in January 2002. The University for Peace (UPEACE) established its Africa Programme in 2002 on the basis of extensive consultations in the continent which aimed at developing a programme that responded to the true needs, aspirations and obstacles for education for building peace in Africa. From its inception, the programme focused on the necessity to stimulate and strengthen the capacity in Africa to teach, train and conduct research in areas of peace and conflict studies. The first five years of the programme focused on the development of curricula and teaching materials and the delivery of a range of short courses, workshops, conferences and seminars in various parts of Africa. Within this period, the programme attracted close to one thousand participants from Academia, Policy makers and civil society organisations. In a second five year plan, which came out of a consultative meeting held in March 2007 with partners, the programme will additionally, work with a number of Partner Universities to develop full fledged Master's degree programmes to be based at African Universities. The principal aim of this endeavour is to further strengthen the African capacity and build a wide expertise for a better understanding of conflicts in Africa, their prevention and the creation of the environment favourable to lasting peace and development in the region. In January 2012, UPEACE created a new Centre at The Hague, Netherlands (UPEACE The Hague), which is housed at the Academy Building of the Peace Palace, next to The Hague Academy of International Law. UPEACE The Hague will focus on education and research at the forefront of peace studies, closely cooperating with academic and policy-oriented institutions in The Hague region. UPEACE The Hague will initially advance three fields where it can be innovative and complementary: Peace & Conflict Studies, Water & Peace, and Urban Peace & Security. In addition, UPEACE The Hague will strengthen peace education in The Hague region by organising professional trainings, lectures, seminars, and workshops. Educational and research programmes will be characterised by the interaction between theory and practice, also contributing to policy innovations, and will therefore be appealing to both academics and professionals. The Geneva Office of UPEACE, established in 2001, has continued to support the development of the overall activities of the University, in particular its regional programmes in Africa and Central Asia. The key focus of work undertaken by the Geneva office is contributing to the development of programme activities of the University in Africa and the Middle East, engaging with the academic community in Geneva to establish joint teaching and training courses on issues of particular relevance to the expertise available within the international community in Geneva and facilitation of relations within Europe and with the United Nations system, national delegations, donor community and academic institutions. In 2010, the UPEACE Asia Pacific Centre (UPAPC) was established in Seoul, The Republic of Korea. The Centre carries out important activities as a think tank for development studies and provides post-graduate training programmes(Masters) in The Republic of Korea. The Republic of Korea acceded to the International Agreement for the establishment of the University for Peace and Charter of the University for Peace in June 11, 2010. The Asia Leaders Programme, a Dual Campus Master Programme, is a shared initiative between the Nippon Foundation and the University for Peace, in collaboration with Ateneo de Manila University, which aims to provide students from Japan and other Asian countries with an opportunity to pursue a peace studies post graduate degree with a content-based language-training module. This offers the support for individuals who do not have a proficient command of English to work in this increasingly common international language and to become comfortable in their professional abilities as they gain academic skills. As part of the programme, students have also the opportunity to apply their academic and practical knowledge through a four-month internship at the end of the Master courses. Article 4 of the Charter of the University for Peace reads: "the University may enter into association or conclude agreements with Governments and intergovernmental and other organizations and institutions in the field of education." The University for Peace signed agreements with the governments of Serbia (formerly Yugoslavia), Colombia and Uruguay to open centres in those three countries. These centres have the necessary legal status to enjoy autonomy and academic freedom, while keeping its humanistic purpose within the framework of both the Charter of the University for Peace and the Charter of the United Nations and the Universal Declaration of Human Rights. The European Centre for Peace and Development (ECPD) in Belgrade, Serbia; the World Centre for Training and Research in Conflict Resolution (WCCR) in Bogotá, Colombia; and the World Centre for Research for Peace (CMIP) in Montevideo, Uruguay, have developed close links with their respective governments while being key UPEACE partners in areas of common interest. UPEACE keeps operational agreements with them and lends its logos when necessary in order to undertake joint activities within the framework of UPEACE's and the Centres’ mission. These activities, as with other partners, involve the cooperating parties working together at all stages of jointly agreed-upon projects. UPEACE has been offering Master’s Degree Programmes at its Costa Rica campus for students from all parts of the world since its establishment. The following Programmes are being offered during the academic year 2012-2013: Regular Programmes • MA in International Law and the Settlement of Disputes; • MA in International Law and Human Rights; • MA in International Peace Studies; • MA in Gender and Peacebuilding; • MA in Peace Education; • MA in Environmental Security and Governance, with a specialization in Climate Change; • MA in Media, Peace and Conflict Studies; • MA in Sustainable Natural Resources Management; • MA in Responsible Management and Sustainable Economic Development; • MA in Sustainable Urban Governance and Peace; • On-line MA in Sustainable Peace in the Contemporary World. Distance Education Courses Apart from its online MA in Sustainable Peace in the Contemporary World, UPEACE also offers a series of individual online courses that can be taken for both academic credits or for certificates. Doctoral Programme The University has announced its new "Doctoral Programme in Peace & Conflict Studies" that is expected to commence in Fall of 2012. According to the website of the University for Peace, "this Doctoral Programme is designed to respond to a growing demand for academic and professional training that addresses the complex and multidimensional issues of peace and conflict in societies." The Programme offers a broad range of research foci and specializations including, though not limited to, Environmental Security and Peace, Gender and Peace Building, International Law and Human Rights, International Law and the Settlement of Disputes, International Peace Studies, Media, Peace and Conflict Studies, Natural Resources and Peace, Peace Education, Responsible Management and Sustainable Development, and Sustainable Urban Governance and Peace. The Programme offers two tracks for achieving the doctorate - a research track and a professional track. Students at UPEACE receive a high quality education in a unique atmosphere with a focus on multicultural perspectives, rigorous theory and practical applications. Thousands of students from over 100 countries have received graduate degrees from UPEACE. UPEACE alumni are working in peace related activities in their home countries and internationally, often in the front lines of conflict situations, for non-governmental organizations, academic and intergovernmental institutions, including the UN system. The University maintains a strong alumni network, all of whom get equipped with the necessary skills to pursue their chosen career paths at UPEACE. UPEACE aims to instill in their students a ‘sense of hope’ that forever ‘changes their lives’ and world vision in order to transform conflicts and promote sustainable peace and security. Notable UPEACE alumni include: Suzanne Hunt (2004) of X-Prize Foundation and Carbon War Room; Dan Juma (2006) former Deputy Director of Kenya Human Rights Commission; Hovig Etyemezian (2005) Director of the UNHCR Office in Mauritania; and Nick Martin (2006) Founder and President of TechChange. The Peace and Conflict Review is a free, fully peer reviewed open source academic journal published by the University for Peace. Articles featured in the review cover aspects of peace and violent conflict with a view to informing students, policymakers, non-governmental organizations and other interested parties of relevant analysis, empirical findings, policy options, and areas for further research. A number of interdisciplinary and multicultural papers are published every year, as well as some review articles of books and conference proceedings. Submissions can be sent online. The Peace & Conflict Monitor is an online forum for informed debate and peace journalism. Drawing on contributions from the students, researchers, and journalists who make up the majority of its wide readership, the PCM offers unique perspectives on current events from around the world. Africa Peace and Conflict Journal is an academic journal focused on African issues related to peace and security and is published by the UPEACE Africa office. The aim of the APCJ peer review process is to be rigorous and free of bias, ensuring that only high-quality, innovative work is published. The interdisciplinary emphasis of APCJ seeks to encourage the building of the field, combining the disciplines of peace and conflict studies, development, and human and social security in Africa. The UPEACE Sharing Knowledge for Peace Program (SKP) is a distance learning initiative which ensures that those unable to attend courses in Costa Rica or in one of the other UPEACE locations are reached through state-of-the-art dissemination methods. ^ "Message from UPEACE Rector". Retrieved 10 December 2013. ^ "UN General Assembly Resolution on Establishment of UPEACE". United Nations. ^ "Charter of the University for Peace annexed to the International Agreement Establishing the University for Peace". ^ "See 'Other Resources' at http://www.un.org/en/peace/". United Nations. ^ "UN General Assembly Resolution A/RES/64/83". United Nations. ^ "Report of the UN Secretary General on the University for Peace, A/64/281, dated 11 August 2009.". ^ "UNESCO Chair on ESD and Earth Charter, awarded jointly to EC Initiative and UPEACE". ^ "UPEACE Doctoral Programme in Peace and Conflict Studies". University for Peace.